Scott Whisnant, Administrator of Community Relations at New Hanover Regional Medical Center, speaks at the legislative breakfast Thursday in Wilmington. The cost of affordable housing in the Cape Fear region keeps on rising. Average rental prices jumped more than 5 percent in Wilmington last year, according to rental aggregator Apartment List. That’s above the rest of the state, and the country. 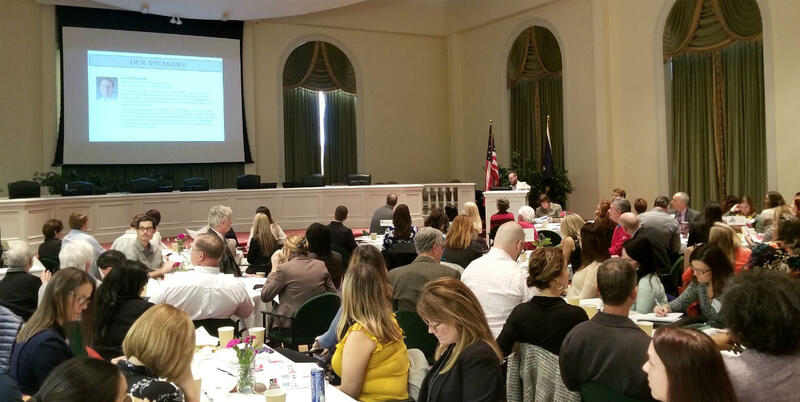 The Cape Fear Housing Coalition addressed the issue at its annual housing and legislative breakfast this morning. A recurring theme at the early morning meeting in Wilmington’s City Council Chambers was housing as a prescription. That you can’t achieve health, job, or substance abuse recovery, without first having safe, healthy, accessible housing. Suzanne Rogers is the community development and housing planner for the city of Wilmington. But to fix that problem, things need to happen in Raleigh. Sam Gunter is the Executive Director of the North Carolina Housing Coalition. He says the Republican caucus lost most of its urban elected officials, but that’s a challenge that local officials hope to overcome. A third of the population in New Hanover County pays more than they can afford for housing. That’s true for both homeowners and renters, but in the rental market, it’s worse. Nearly half -- about 46% of people who rent in New Hanover County pay more than a third of their income for housing. Some community leaders call that a clear sign of a shortage of affordable housing. Gentrification is a loaded word. It typically connotes a rise in property values in a traditionally low-income neigborhood. Wealthier people move in. Those who’ve lived there and are already struggling to pay bills from month to month can no longer afford to live there due to rising rents and property taxes. Recently, the topic of affordable housing has been in the spotlight in the Cape Fear region, and in North Carolina as a whole. Just last month, Wilmington City Council established a committee to investigate solutions to the lack of affordable places to live. At a recent public hearing held by the Cape Fear & North Carolina Housing Commissions, attendees tossed around ideas for solutions.